From the minute you heard your baby’s heartbeat to the moment he took his first breath, you knew you wanted to be the best mother you could be. To watch with pride as he bravely explores the world around him. To protect him, and guide him with a firm yet gentle hand. Doing everything you can to ensure he grows up strong and healthy, in mind and body. Naturally, you’ll be looking for a milk formula that does the same. 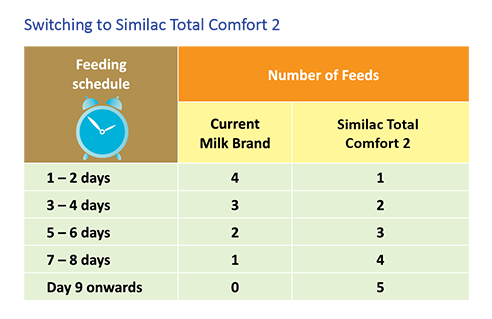 2 out of 3 formula-fed babies experience formula feeding tolerance issues such as gassiness, bloatedness, fussiness (crying), spit-up, constipation, colic and eczema. 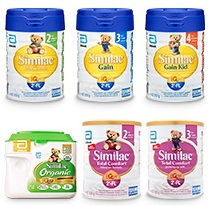 Your ideal formula would need to support your baby’s total development, especially his rapidly growing body and brain. It would also need to be gentle and easy-to-digest to take care of his daily tummy comfort. Buy nowSend me a free sample! Added with nucleotides that support your child’s natural body defences. 100% partially hydrolysed whey protein broken down to smaller molecules. RRR-vitamin E is a natural form of vitamin E. Lutein is an integral part of the eye’s retina. DHA and AA are building blocks for brain and eye development. Omega 3 & 6 are precursors of DHA and AA. Taurine helps support overall mental and physical; development. Choline supports overall mental functions. A unique vegetable fat blend with no palm oil. 2’-FL is an oligosaccharide that is derived from lactose. Prebiotics (FOS) support the growth of good bacteria to maintain a healthy digestive system. Total Potentially Available Nucleotides (TPAN), a blend and level of nucleotides that support your baby’s natural defenses. Antioxidant system with beta-carotene, plus selenium, zinc, vitamins C and E to help protect cells from free radicals. * Standard reconstitution is 152.0g of powder brought up to one liter with water. Gas, fussiness, spit-up, constipation, eczema and colic are very common formula feeding problems among young children. Marketing research suggests that two out of every three children experience these types of common feeding problems.1 Intolerance symptoms such as fussiness, gas, spit-up may be due to lactose sensitivity and eczema may be due to cow milk protein sensitivity.2 These symptoms can be a source of frustration for both baby and you. The word that is used to refer to these common issues with baby's digestive system is "intolerance". Follow-on formulas are carefully designed for the nutritional needs of a baby after 6 months, but since your baby’s digestive system is still growing and maturing, it may mean that baby is not able to digest certain nutrients well. Lactose sensitivity can cause abdominal pains, spit-ups, gas and cramps. This happens when the bacteria in baby’s large intestine ferments non-digested lactose to produce gas and other compounds. This can cause bloating and watery stools. Switching to a low lactose formula can be an easy first step to help manage a child’s tolerance issues. 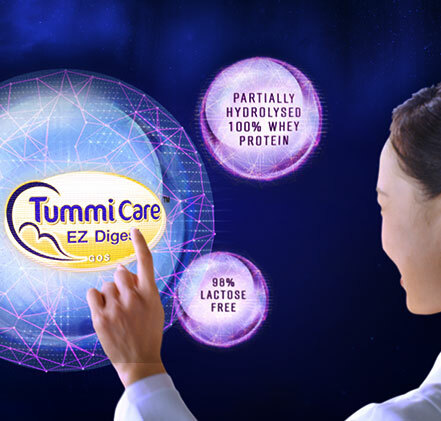 During digestion, proteins are hydrolysed into di- and tripeptides and amino acids that are absorbed into the small intestine.3 Some formulas have their protein source partly broken down (partially hydrolysed) to support easy digestion by babies. Sometimes children with cow milk protein sensitivities may develop eczema - a skin rash characterized by itchy, red, or scaly patches. Prebiotics like GOS have been shown to promote the growth of ‘good’ bacteria in the gut that help suppress the growth of harmful bacteria and maintain a healthy digestive system. EASY-TO-DIGEST FORMULA WITH EYEQ PLUS SYSTEM.